This letter was written two days after the Ministerial Statement which promulgated the news that the PJM was only acceptable as a keepsake. This letter provides us with the first official interpretation of the Statement. Here you have it from the horse's mouth. The PJM is a second class medal awarded to second class citizens. You can't wear the PJM because that display of pride would bring other medals into disrepute! How do the wonderful people of Malaysia feel about this snub? We just want to tell them that the unelected members of the HD Committee do not represent us, the veterans who served Malaysia and who do appreciate the Malaysian people's gracious offer. This letter comes from the Ceremonial Secretariat of the Cabinet Office - it is they who are responsible for matters such as the Honours and Decorations Committee and the PJM. The PJM is clearly stated as being for 'service'. There is no mention of the award being considered as 'commemorative'. As we know, the HD Committee have relied upon two rules when recommending a resticted award, i.e. double-medalling and events longer than five years ago - both of which we contest. The PJM was not judged as being a medal 'appropriate' for wearing - there is no qualification about 'formal' permission not being given. We have always been aware that Australia and New Zealand opted out of the Imperial Honours System - now we know why. Whilst the Governments of Australia and New Zealand have advised The Queen to make the PJM an unrestricted award that can be worn with pride, the HD Committee told her not to allow the same honour to be given to British citizens. The Cabinet Office refers to Australia and New Zealand allowing their veterans (not, we note, citizens) to both receive and wear certain campaign medals awarded by foreign (note, they do not use the word Commonwealth) governments. The Cabinet Office is clearly trying to make several points here. The HD Committee decided that the wearing of the PJM would compromise previous awards and the integrity of the Imperial Honours System. 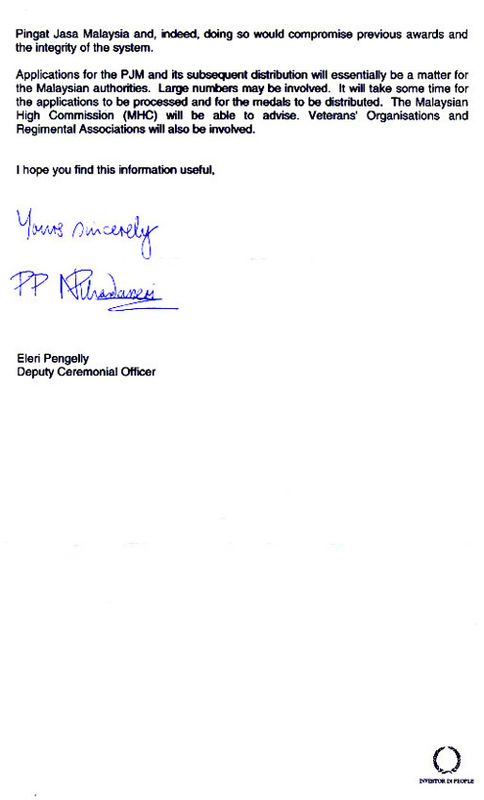 Comment = I have just had a close look at the letter shown here above, from the Office of The Cabinet. These people hide behind The Queen's skirts, not once but twice in this document. 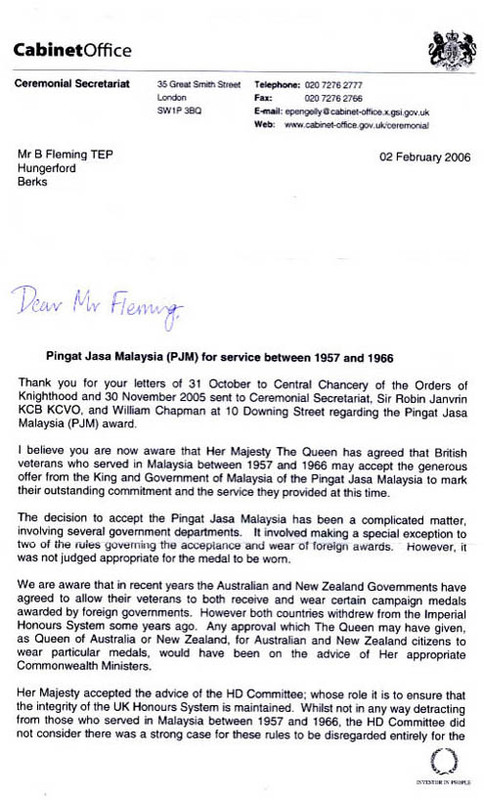 "Her Majesty accepted the advice of the HD Committee:"
"Her Majesty The Queen has agreed that British veterans who served in Malaysia between 1957 and 1966 may accept etc..."
Do these 'people' think that we came down in the last shower of rain? "It involved making a special exception to two of the rules governing the acceptance and wear of foreign medals." Here, 'they' refer to Malaysia as being a 'foreign' county. I always thought that Malaysia was a member of The Commonwealth. Have these 'people' changed that too, without telling anyone? Any approval which The Queen may have given as Queen of Australia or New Zealand for Australian and New Zealand citizens to wear particular medals would have been on the advice of Her appropriate Commonwealth Ministers. Ah, but its alright in the end. Australian and New Zealand are still in The Commonwealth. Comment=Why not change the whole system of awards. I served with some Brits who had 6 clasps on G.S.M. Why not 6 medals. Some Royals wear New Zealand medals. Entertainers get M.B.Es upgraded to knighthood. Service men get clasp for G.S.M. Comment=This seems like another snafu by the big nebbies just like the veterans medal. OK for the scrambled egg but not for the ones who do the job. I spent six years in Singapore in two tours and a spell in Borneo. On the same topic but of an earlier time, I was also in the Oman for over thirteen months on and off from Bahrain. We were supposed to get a medal for that as well. Where is it?